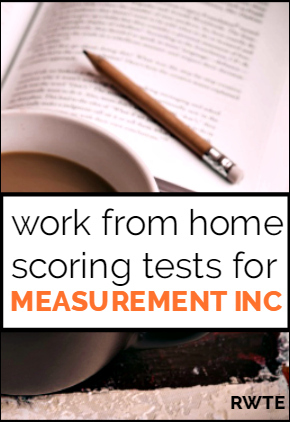 Work at Home Scoring Jobs at Measurement, Inc. Published May 2, 2015 By Anna T. This post may contain affiliate links. Regardless, I only recommend sites I've researched and/or used and trust. Measurement, Inc. is a reputable company with occasional openings for work at home test scorers. In addition to remote opportunities, they also have nine brick and mortar scoring centers across the US. However, this overview will focus on the work at home scoring opportunities. It looks like Measurement, Inc. only hires remote scorers based in the United States. About Remote Test Scoring For Measurement, Inc. When this job is posted, you'll see it listed as “Reader/Evaluator.” The work at home reader/evaluators will score essays, open-ended test questions, and/or performance assessments. The criteria for scoring will vary depending on the project. Measurement, Inc. handles scoring needs for multiple states and multiple grade levels. Keep in mind this is project-based, temporary work, so you may not be able to count on it long-term if you are hired. The Measurement, Inc. website states that they need scorers from September to June each year, but they need them most between January and June, so right now may be a good time to apply if this interests you. Most projects last around four weeks, maybe a little less. You are allowed to pass on projects you don't want to do. This won't disqualify you from accepting projects in the future. If you have a bachelor's degree in any field, there is a chance you could be hired by Measurement, Inc. to score tests. The degree is their main requirement. You do not need any past teaching experience or certification. And as mentioned above, you'll have to prove you're eligible to work in the United States. Pay For Scorers at Measurement, Inc. The website doesn't say what the pay is, other than it varies depending on the project. However, I checked Glassdoor (my favorite site for digging up the little details) and it looks like the reader/evaluator job may pay somewhere in the neighborhood of $11 hourly. There is a training period that lasts for a couple of days before you start scoring, and this is also paid. This appears to be fairly flexible, although you will be expected to work Monday-Friday every week until the project you're on is completed. The website says that the exact hours you work will vary depending on the project you're on. All you need to score at home for Measurement, Inc. is a high-speed internet connection, a home computer, and a work area that can be secured. I haven't been able to find very many negatives. The company has a high rating on Glassdoor. Most workers find it to be easy, flexible work. A few did say that the pay isn't quite high enough considering the bachelor's degree requirement they have in place, and of course there are many people who wish the work lasted longer rather being a temporary, seasonal gig you can't continue to count on for income. If you are eligible to work in the US, can prove you have a bachelor's degree in any field, and you would like to take on some temporary, project-based work, Measurement, Inc. might be a great option. You can go here to read more details on the home-based reader/evaluator position and apply. And, if you need to find more education-related jobs from home, you can always sign up for a monthly membership at FlexJobs (a site I use sometimes). They list hundreds of work at home positions daily. I’ve worked on several projects for this company; the pay is pretty good for those seeking part-time work, and the job is easy. The biggest drawback is training is somewhat rigorous, and you have to pass the certification test, otherwise, they’ll let you go. Fortunately, they give you a few more attempts at passing the test. Additionally, as mentioned earlier, the job, for the most, part is seasonal, so the likelihood of securing a full-time permanent position is nil; however if that’s not what you’re looking for, it’s no big issue. I second the reviewer’s comment regarding passing on projects; I’ve had to pass on a few, yet they’ve still called me back. Overall, I like working for this company, and it’s perfect for someone who’s looking for some extra money; especially during the holidays. When they say you work Monday–Friday when on a project, is that full-time hours? I have a part-time job that I would have to work around. Where can I find info if I can work from NY? If you work for ETS (doing similar work), can you still work for them? They are not licensed to do business in all 50 states, only a few. Make sure you check because I sent a resume, went through a phone interview, etc. only to stop hearing from them all the sudden. After several inquiries from me someone let me know they are not licensed to do business in my state. I have worked with this company in past but on location at one of their sites. I am happy to say that I reapplied as a remote Teacher reader/evaluator about 2 weeks ago,completed my testing last week, and sent proof of my college degree. This morning I received an email saying that my references were needed. My mentor sent my recommendation and soon after that I received my onboarding information. I am not sure when the assignment begins but I will certainly report back with any information I am allowed to share. The website does say they pay 10.70 for remote workers. I am interested, I have a BS in Biology.